George Graham Reviews Ari & Mia's "Unruly Heart"
Perhaps it's a reaction to the artifice of most contemporary commercial pop music, with its in-your-face, relentless sound, and highly processed totally phony-sounding electronically pitch-altered vocals, but there seems to be a significant revival of acoustic music with a traditional sound among younger performers -- musicians even whose parents are probably a bit young for the 1960s folk scene. While a number of these players are taking an interest in traditional songs, or the acoustic singer-songwriter-troubadour mode, there are quite a few others who are starting with traditional instrumentation and going in unconventional directions, using instruments like the cello. This week, we have another delightful recording that inhabits the eclectic acoustic mode and makes a distinctive hybrid that sounds like traditional music but has a lot of contemporary facets. It's the debut CD by the sister duo of Ariel and Mia Friedman, who appear as Ari & Mia. Their CD is called Unruly Heart. The Friedman sisters are from the Boston area, and both have formal classical musical training. Ari mainly plays cello and wrote most of the original material. Mia plays a variety of instruments, banjo in clawhammer style, guitar, and fiddle. Instrumentally, they can resemble another Boston area group with the cello-banjo combination , Crooked Still, but even on first release, Ari & Mia have forged a distinctive sound with their very appealing vocals and sisterly harmonies. Most of the material is original, but like that of Crooked Still, Ari & Mia's new songs can sound like music from the 19th century or earlier, and indeed on a couple of pieces, they create new music for old poetry. Also like the members of Crooked Still, the Friedman sisters comes from an academic background musically. Ariel is classically trained on cello, and both sisters are attending the New England Conservatory of Music in their Contemporary Improvisation program. And one can hear that facet of their background at times in their music, along with hints of jazz, old Gospel music, and their most prominent influence, old-time Appalachian folk. They are joined on the CD by a number of additional players, perhaps the best known of whom is Sarah Jarosz, whose own eclectic acoustic CD we reviewed in 2009. Frequently featured is Owen Marshall, who plays the guitar plus other instruments like bouzouki and harmonium. Also heard on guitar is Rebecca Wudarski, and a third Friedman sister, Shoshona does backing vocals. 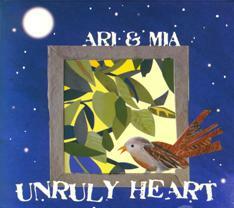 Ari and Mia's new debut CD Unruly Heart is a thoroughly enjoyable recording that marks another young group venturing off into eclectic acoustic material, about 180 degrees from the contemporary commercial pop one associates with Friedman sisters' generation. Like their slightly older contemporaries, Crooked Still, Ari and Mia mix cello with Appalachian-folk-influenced music with clawhammer banjo, sometimes Gospel-like textures, and throw in jazz and even classical influence. Sometimes, their music can remind me of classical composer Aaron Copeland's approach to traditional American folk music. The result is eminently listenable and quite appealing. Our grade for sound quality is close to an "A." The acoustic instruments and the Friedman sisters' vocals are very well recorded, clean, open and often intimate. By contemporary standards, the recording is not overly compressed, making for a decent dynamic range. While it's hardly a dominant trend, it's nice to see growing numbers of younger generation performers venturing into eclectic acoustic music, groups like Crooked Still, Hey Mavis, The Punch Brothers, and Sarah Jarosz. Ari and Mia's new CD is another great example, with its fine musicianship, feeling for the traditional with a sense of adventurousness. (c) Copyright 2011 George D. Graham. All rights reseved.